British gin has grown by in 18% in the last two years alone, with premium offerings growing by nearly 50% in the same period, leading to calls for a change in the “punitive” UK tax regime. Globally, gin output is expected to reach 13 million litres per year, with much of this growth being met by British producers. Fuelled by the emergence of a number of small, craft gins and growth in premium brands, research commissioned by the Wine and Spirit Trade Association (WSTA) shows that the industry has grown in value by 9.6% in the last year and 17.9% over the past two years. The CGA and Nielsen figures also show the export potential for British gin, with growing consumption in all of the top five global markets. Gin made in the UK now accounts for 20% of the world’s supply, a position achieved in spite of what the WSTA calls the “punitive tax regime” in its home market. UK consumers pay 79% in tax on bottles of gin, the highest for any alcoholic product, with this tax having increased by 44% since 2008. In response to these figures, a number of British gin producers have voiced their anger over the UK tax system that they claim is holding them back from further growth. Christopher Hayman, chairman of the family-owned Hayman’s Gin Distillers, said: “A 2% cut in duty would have a substantial impact on our business. We have enjoyed over 150 years of success, dating back to 1863, through care and dedication to the gin we produce. Similarly, Alexander Wolpert, founder of the East London Liquor Company said: “We are proud descendants of a historic gin tradition in the capital… We can see first-hand the incredible revival that gin is enjoying in London. 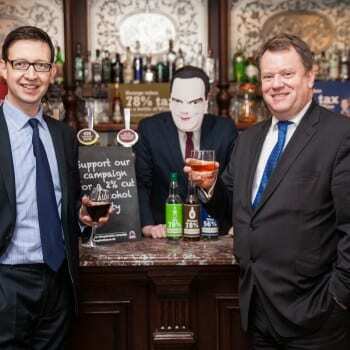 He and others are supporting the “Drop the Duty” campaign being led by the WSTA and the Scotch whisky association, which is calling on the government to encourage further growth in the UK’s wine and spirits industries by making a 2% cut in alcohol duty.